India's third-largest e-grocer PepperTap shutting shop reveals the challenge of running a tech startup, expanding aggressively and managing customer expectations as discounts recede with longer path to profitability. It also shines some light on the complexities related to the grocery vertical and throws some takeaways. To be sure, it is not the first such prominent venture capital-backed name to pull the plug. Early this year, two of the top three most funded tech ventures in the country—Flipkart and Ola—decided to discontinue their experiments where they toyed with hyper-local e-grocery. Late last year, another venture capital-backed e-grocer LocalBanya—which was flashing full-page ads in national dailies even as it was contemplating to shutter its business (the site still insists it is in the process of pivoting its business model)—stopped taking orders. In the past, Naspers-backed Tradus pivoted from being a horizontal marketplace to a hyper-local grocery marketplace only to eventually down shutters; Godrej Group acqui-hired EkStop and Satvacart is in talks with a large general e-tailer for a deal which may lead to its buyout. With PepperTap discontinuing the service as it pivots to become a logistics firm, e-grocery becomes largely a two-player game with BigBasket and Grofers even as a bunch of startups, including GrocerMax—launched by former Reliance Retail and FoodWorld executive K Radhakrishnan—tries to build a business. Then, Amazon, which partnered local kirana shops to test the waters for grocery, remains in the business but does not push it in a big way. "Ordinarily, some players closing becomes good news for players not closing because the level of competition reduces. However in this case, it was not the level of competition which was the cause of the problem, but the flawed economics,” says Ajeet Khurana, an entrepreneur-turned angel investor, who has invested in an e-grocery startup RainCan. Khurana argues that the key lies in delivery charges and passing them on as a cost to the consumer. His portfolio firm RainCan has a subscription model where a guaranteed repeat purchase brings down the lifecycle cost of delivering. PepperTap was not charging for deliveries where the basket size of the order was over Rs 250. BigBasket has a threshold of Rs 1,000 for free delivery while Grofers charges Rs 49 as delivery fee for orders below Rs 350. Are more in the pipeline? PepperTap's closure also rings a bell for its closest competitor Grofers. Both essentially linked consumers with local shopkeepers and grocers, and were inventory less businesses against BigBasket that has a full stack warehouse-centric business. While PepperTap followed a managed marketplace where it did not spell out the name of the actual vendor to the buyer, Grofers gives names of the shopkeepers who are to service the order, upfront. Interestingly, Grofers was the first to report business turbulence. In October, Grofers had temporarily halted operations in Delhi and parts of the national capital region to resolve last-mile delivery issues. In January this year, it discontinued its business in nine cities, citing lack of demand. A month later, PepperTap too scaled down business by shutting operations in six cities. To be fair, Grofers' bigger funding history—it has raised $200 million or almost four times the amount raised by PepperTap, according to VCCEdge—gives it a much longer runway compared with PepperTap. But the similarities in business model and recent developments, put it in the watch list. For BigBasket, this is good news as it has one competitor less to deal with. It had recently added express deliveries to take on the 'on-demand' e-grocers. Fresh with big funding, it is set to consolidate its dominance further even as it has to navigate the legal structure of its business to comply with the foreign investment norms in e-commerce. Grofers and BigBasket declined to comment on this story. AaramShop, another player that also connects consumers with local stores, has been in the business for years. However, it has not attracted large investors and remains a bit player. Yet another such small-time competitor MyGrahak shut shop earlier. Snapdeal, one of the top three horizontal e-tailers, had invested in PepperTap, arguably looking at it as a test bed for dipping its toes in the grocery space. It could well have been a bet with an eye on a possible merger in the future. PepperTap's closure means it may also put any such plans on the backburner for now. 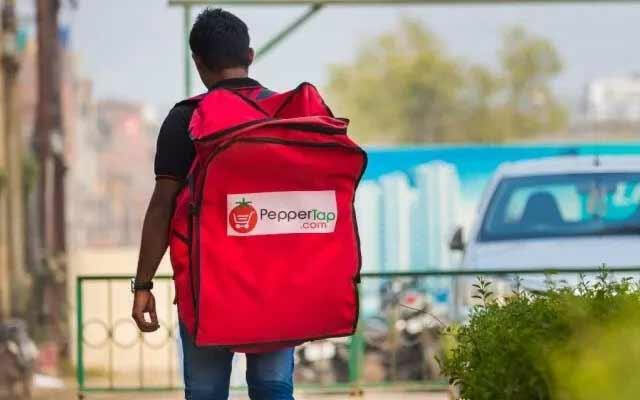 Indeed, PepperTap's parent Nuvo Logistics Pvt Ltd's plan to pivot its business to become a logistics company goes well with Snapdeal's investments in the delivery space. It had made a strategic investment in GoJavas, former in-house logistics unit of fashion e-tailer Jabong. He argues that grocery is a significant component of a household's purchase, and most customers tend to be price conscious. “Our belief tends to be that an e-commerce venture should be able to price better than traditional retailers. We are seeing that even if the e-commerce players sell at the same price as the grocery store, they can't make the money because of the thin margins in this industry," says Khurana. But others like Samar Singla, CEO of auto aggregator Jugnoo that had also started grocery delivery nine months ago but pulled down the shutters in November, remain bullish. "Peppertap and Grofers started burning so much cash—people were literally getting paid to get grocery delivered at their homes. We didn't want to play the burn game; so we decided to shut down. The moment they (Grofers and PepperTap) closed down operations in some cities, we started doing it again in Chandigarh. We always believed in the e-grocery business, but the idea was never to burn cash," he adds. Jugnoo that just topped up its Series B funding round with additional money from existing investors while pushing back a bigger Series C round of funding, is now looking to again scale up the e-grocery business. It aims to launch its e-grocery service in all 30 cities Jugnoo is present in. "Negativity is always good; it keeps you focused. It is a correction phase; I think bad business models are shutting down," says Singla. According to consultancy firm Technopak, the food and grocery retail business constituted about $370 billion of the overall $530 billion retail (merchandise) spending during 2014-15. But it’s not easy building the business with its complex supply chain and the perishable nature of the goods making delivery at doorstep expensive. Technopak observed that globally e-tailers have struggled to develop a successful business model for food and grocery, which, according to a 2012 research report, constituted a mere 2 per cent of e-commerce in a mature market like the US. In India too, the consultancy believes, e-commerce would be driven by non-food categories.